UDM Downloads > Audio Editor Pro! 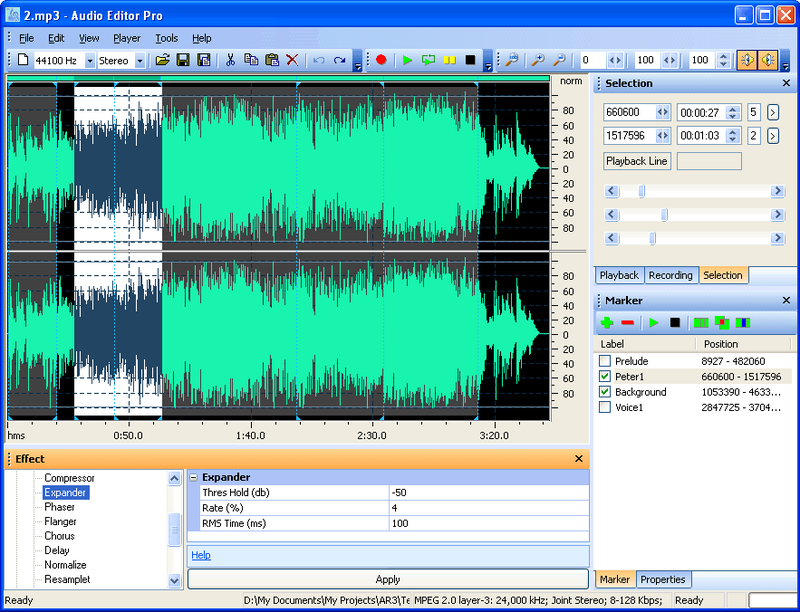 Audio Editor Pro is a visual multifunctional audio files editor for Microsoft Windows. It allows you to perform various operations with audio data such as displaying a waveform image of an audio file, filtering, applying various audio effects, format conversion and more. Supports all major audio formats. Provide more than 20 sound effects and 6 filters. Support mp3 VBR codec and Windows Media 9 format. Support ID3 tag and CDDB. Features Editing - Open, create and save audio files. Play an audio file or any part of it. Visually edit an audio file (Cut, Copy, Delete, Paste, Paste From File, Mix, Mix From File and Insert or Delete noise or silence in an audio file) Display - Display a waveform window of an audio file and apply zooming Recording - Record new audio file from a microphone or another input device Digital effects - Apply different effects (Amplify, Delay, Equalizer, Fade, Flanger, Invert, Normalize, Reverse, Multi Tap Delay, Silence, Stretch, Vibrato, Echo, Chorus) Audio filters - Apply different filters to the selected part of an audio file (Ban Pass Filter, High Pass Filter, High Shelf Filter, Low Pass Filter, Low Shelf Filter, Notch Filter) Support all major audio formats - Supports a wide range of audio formats ID3 tag & Media information - Insert and change information about an audio file (Album, Artist, Channels, Comments, Copyright, Genre, Title, Year) Markers - Use markers in your audio file to quickly select between different selections! Selection tool - Select a part of your audio file precisely with the selection tools of Audio Editor Pro Audio Editor Pro supports the following file formats Waveform audio (WAV) MPEG Audio (MP3 and MP2) Windows Media Audio (WMA) Audio CD Tracks OGG Vorbis Audio VOX Dialogic ADPCM RAW Audio Build-in Powerful Audio Tools Audio Converter - Converting one file type to another. CD Ripper - makes direct digital copies from audio CDs and saves them as MP3, WMA, WAV, and OGG.